We just grabbed our customary mint on our way out of the Asian Bistro by our house but when we opened it, it wasn't a mint and the wrapper was almost all in Chinese (I think). It was an Asian bistro, but most of the food was Chinese, so I'm guessing that it's Chinese. 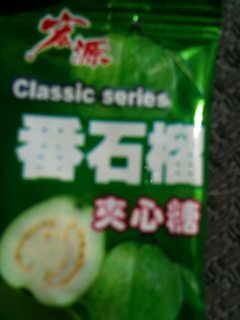 That is Classic Series Guava Candy made by HongYuan. You can buy a 14oz bag on Amazon, here. It is called Guava flavored Chinese candy. Not the answer you're looking for? Browse other questions tagged candy chinese-cuisine food-identification or ask your own question.